bunny mama's corner: Brighten up the day! Anyway, this day is so grey, that I just wanted to brighten it up (or at least my blog) with some colourfull pictures. That's why I'll show you the project I made for a great friend and a wonderfull person on her birthday. She likes coffee, so the present had to be coffee-related. And here it is: a mug with a mug warmer (not really shure how to call this thing), a tin with some coffee, a mug rug and a birthday card. It all started with the mug rug and a pattern I found in Pink Penguin blog. It's owner, lovely Ayumi, kindly shared not only the pattern for it, but the wery clear instructions on how to make it. I really got inspired and started it stright away. Please bear in mind that this is my wery first mug rug and I wasn't sewing anything for quite a long time. Last time I had some experience with my sewing machine even before Little Man was born, I think. So it is not ideal. But I had so much fun making it! And I will definetly make some more. 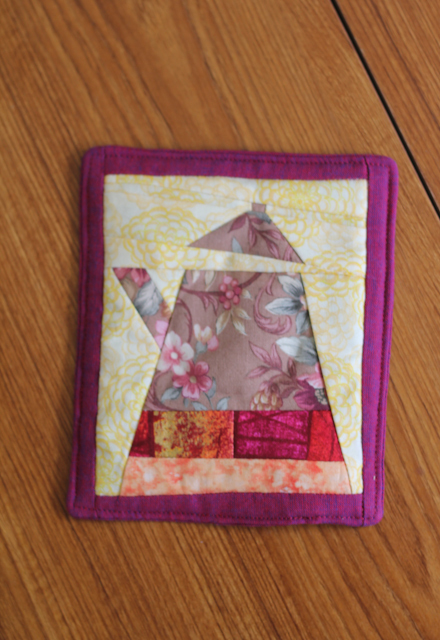 I really like the idea of a mug rug itself and it might be a good project to practice in quilting. 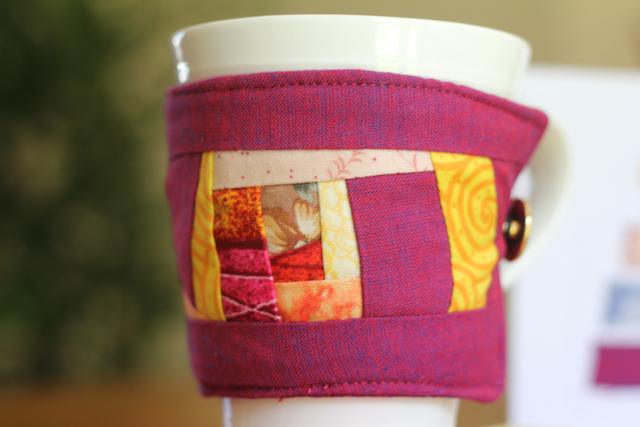 The mug warmer was made as a crazy quilted peace using the fabrick scraps I had from the mug rug. And here is the other side of it. So, I feel a bit more in the mood now and will go and have some knitting done. Hope you all have a nice evening and if you like sewing and are between projects at the moment, go and try Ayumi's little tea pots! You will enjoy it, I promise! He is sooooo cute! Found here and painted by Anastasia Loseva from Latvia, the country I originally come from and the country we (me and Little Man) are flying to in a week to meet my family. 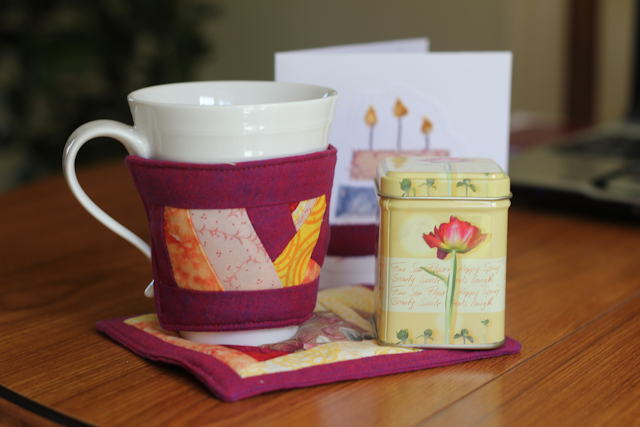 WOW - love the mug hug and mug rug :)such great colours. What a cool idea for the card as well. Ohh your mug rug looks so nice! The border adds such a great contrast to it! 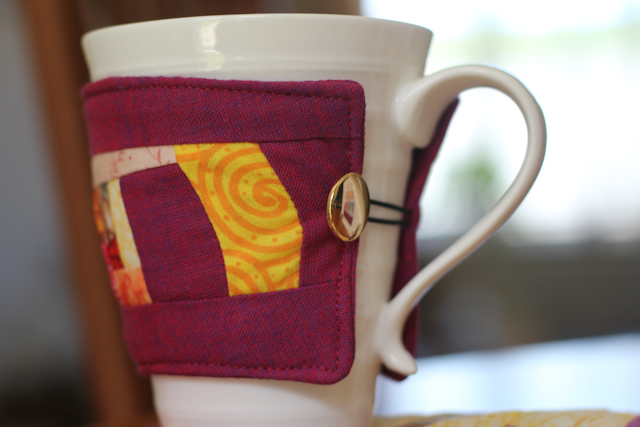 I can't believe it is your very first mug rug! It is too perfect! The matching warmer is great too!! oh, thank you! 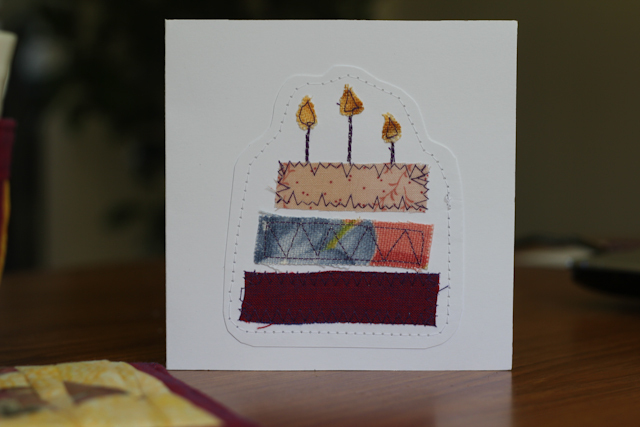 so nice to hear so many compliments from a professional :) I really like all the things you make and your lovely blog!